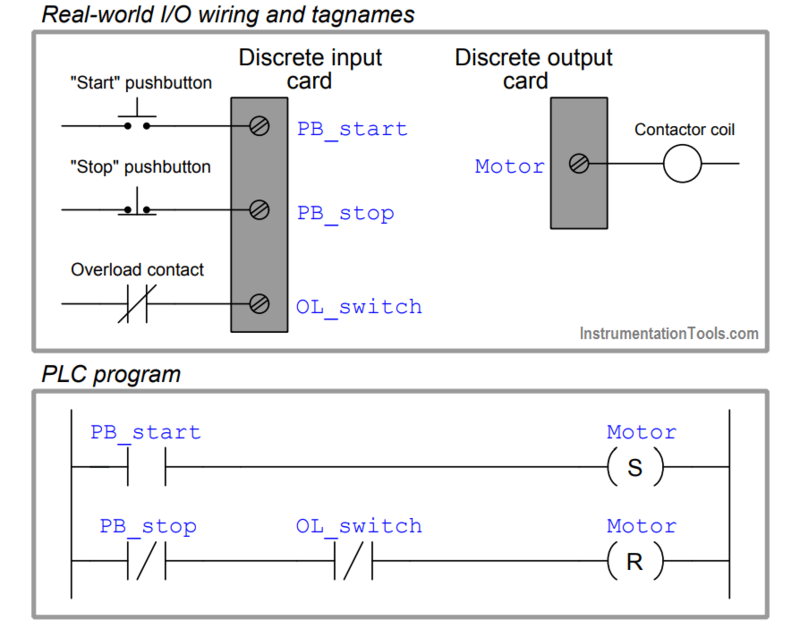 The PB_stop and OL_switch instructions in the second rung of the PLC program need to be connected in parallel with each other rather than in series. Being NC real-world switches and NC contact instructions, each one will “color” when the motor is supposed to stop (i.e. the PB_stop instruction colors when anyone presses the Stop pushbutton, and the OL_switch instruction colors when the motor overheats). Right now, programming in series with each other, both conditions would have to take place in order to stop the motor! To make the motor stop if either condition occurs, we need these two instructions to be programmed in a logical “OR” fashion, and that necessitates a parallel connection between the two contact instructions.